Unpredictable weather can be so annoying at times! Blasting sunshine with extreme heat and interspersed with sudden erratic thunderstorms, lightning and heavy rainfall have been the norm for the months of March and April! Hardy plants just love them while the less hardy ones especially newly planted or repotted plants simply dread such extreme sudden changes in temperatures. 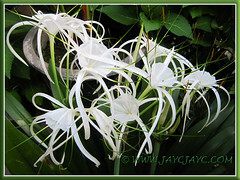 Overall, our garden plants in tropical Malaysia managed to challenge the dreadful weather and their happy smiling faces give us the impetus to carry on, regardless. This clump of cane-like upright stems with lustrous dark green leaves and topped with vibrant red cigar-like inflorescences (as seen in the image above) will bloom bountifully all year long, come rain or shine! They flourish best in the ground rather than in pots. 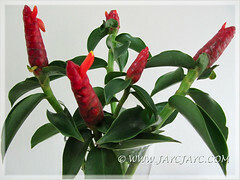 The plants grow vigorously and currently stand about 1.3 m tall, shining like a beacon. How wonderful to enjoy their presence at our front yard. Obviously an attention grabber… the lovely contrast of lipstick-red flowers held above the green foliage creates a dramatic flair in our garden landscape. Recently, we tried using them as cut flowers in a vase for the first time. We were pleasantly surprised that they could last about a week indoors. Even the tiny orange flowers would peep out gradually to amaze us! Known commonly as Caribbean Spiderlily, Spider Lily and White Lily, these are sheltered behind the Costus woodsonii and not seen from the front. How lovely… this is the first time that three flowering spikes emerged at the same time, like cheerleaders! We love to stroll in the garden in the late evenings whenever they’re in bloom as that’s the time their flowers exude a sweet fragrance that’s simply irresistible! This plot definitely needs tidying and an overhaul. I’m fully aware that it has been neglected far too long. Hmm… This area gets blasting sun almost the whole day and can only accommodate plants that withstand extreme heat. We’ve grown various plants here, such as Brunfelsia pauciflora, Crossandra (Firecracker Flower), Lantana camara, Melampodium divaricatum (Butter Daisy), Torenia fournieri (Wishbone Flower) and Ruellia brittoniana, but discarded them all as these plants easily attract infestation of white flies. Hence, not our cup of tea as they’re not low maintenance plants, need more care and be treated with pesticides when stormed by garden pests. Wonder what kind of hardy flowering plants should we add here? Will probably retain the colour theme of yellow and pink. Lemon Grass stays as they thrive well in the ground and will try to add Sunflowers for the back too, beside it. If the latter is unavailable, then may retain the Bachelor’s Button since they’re happy in that spot. Will scout for low-growing plants for the front… maybe a yellow Dwarf Ixora will be most appropriate as it’s hardy, loves the sun, pest-free and a very reliable bloomer. This is another of my favourite spot where it previously housed the potted Lady Palms that attracted the nesting White-browed Yellow-vented Bulbuls. 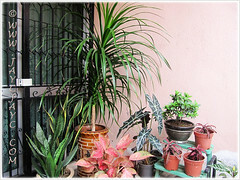 Now we have the potted Dracaena marginata, the green variety as the focal point. We’re extremely happy that it is growing so luxuriantly and towering about 1.3 m in height. It’s accompanied by low-growing foliage plants, namely Alocasia sanderiana, Rhododendron simsii, Cryptanthus bivittatus, Aglaonema cv. Legacy (a Thai hybrid), Sansevieria trifasciata ‘Laurentii’ and another cultivar. Rhododendron simsii, which was added to our garden in early February is flowering for the first time under our care after being transplanted into a larger pot. 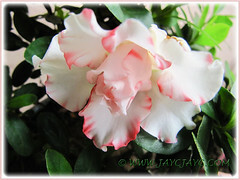 This white flower with frilly pink trimmings is simply gorgeous! 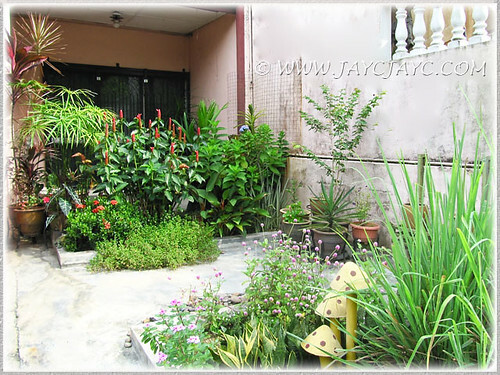 Haha… not our land, but ‘illegally claimed’ this small space to be ours by planting a palm tree, Adonida merrillii (Christmas/Manila Palm) there, about seven years ago. The only care given to it was to dispose of withered fronds to keep it tidy, the rest is being surrendered to mother nature who does a better job than any man can ever do! How wonderful to enjoy its lovely clusters of fruits, especially the fabulous red ones. 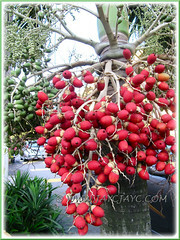 This is the first time that the squirrels left alone the whole bunch of ripen fruits to dazzle us. I simply love the richness and brilliance of its red colour! Gathering around its trunk at the base, are self-seeded Catharanthus roseus (Periwinkle) that grow wild and fabulously, without a care in the world! Isn’t that nice, without any help from us? 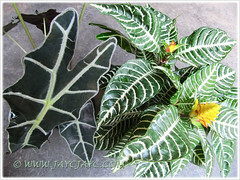 I have fallen in love again with Alocasia sanderiana (Kris Plant) and Aphelandra squarrosa (Zebra Plant)! We’ve grown these many moons before but just couldn’t take my eyes off them that afternoon when we visited a nearby garden center recently. 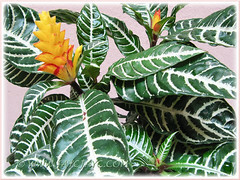 Their variegated foliage appear terribly fabulous and lustrous. Coincidentally both these plants fitted my ardent love for variegated leaves and my beloved John who saw my enthusiasm, wasted not a moment to purchase them for me. How thoughtful! Sad to say that the pot had three lovely flowering stems initially but now has only one remaining stem. Seeing that the stems have outgrown the 4-inch pot, I carefully transplanted them into a bigger pot and place it outdoors at a semi-shaded location, not knowing that it’d take less than three weeks of torrential rain to rot two of the healthy stems. Fortunately, at least one survived when I relocated it at a covered area under the porch. Keeping fingers crossed that the surviving stem will sprout new branches to enable me to propagate new plants. Is that far-fetched, I wonder? A young plant producing chilies for the first time. The parent plant which was grown in the large, antique dragon pot as seen in the background, and provided innumerable chilies for us and our friends had been discarded when heavily infested with white flies. Unfortunately, this young plant is being infested too. Eeek… looks like I’ve to squash the idiotic pests diligently to ensure the plant’s survival!! 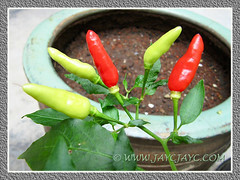 These Tabasco Pepper (known locally as ‘Chili/Chilli Padi’) are small but super hot and fiery! Brumfelsia, Crossandra, lantana, Melampodium, Torenia and Ruellia. Thanks to you I have known the names of many plants that we share. Regarding whiteflies, also have infected two of my plants. The Crotron gold dust and Mirabilis jalapa, I sprayed with diluted liquid soap dishes twice a day, the croton was healed but mirabilis jalapa was very infected, I had to cut. Tell me about the weather – its still unpredictable until now. 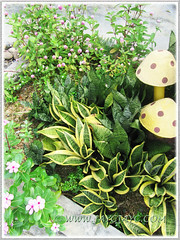 I just lost my mood gardening as it rains everytime I touch to prune or plant. So much that I abandon the garden except watering before going to work. Recently, we have discarded some of our plants that have been invested with white flies… aargh, they just love our hot weather! Too lazy to treat them, so took the easy way out.